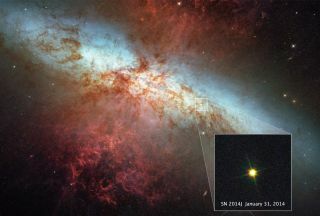 The supernova SN 2014J is seen (inset) in this Hubble Space Telescope photo captured on Jan. 31, 2014. The supernova, which was discovered on Jan. 21, is in the M82 galaxy about 11.5 million light-years from Earth. Scientists are using the supernova to learn more about how white dwarfs can trigger such catastrophic star explosions. Supernovas, the most powerful stellar explosions in the universe, may result from catastrophic nuclear explosions on dead stars, new research shows. Scientists had long theorized that such nuclear events cause some supernovas, but now researchers finally have direct evidence. A supernova shines brightly enough to briefly outshine all the stars in its galaxy, making it visible from halfway across the universe. Such explosions are rare, only occurring within each galaxy about every 100 years. Researchers have suggested that when a white dwarf has a companion star, the white dwarf's gravitational pull can strip matter off the nearby star. This can result in too much extra material on the white dwarf, eventually destabilizing it and setting off a thermonuclear chain reaction that explosively obliterates the white dwarf. However, until now, astronomers did not have direct evidence for this idea. To search for such evidence and learn more about how type Ia supernovas happen, scientists investigated the supernova SN 2014J, which occurred in January. The explosion happened in a nearby galaxy called M82, located about 11.4 million light-years from Earth. Astronomers studying SN2014J, a Type Ia supernova discovered in January 2014, have found evidence that this type of supernova is caused by a white dwarf star reigniting and exploding. This sequence shows the steps leading up the explosion as the white dwarf leeches material from a companion star, and ultimately explodes. Until now, type Ia supernovas had exploded too far away for astronomers to detect any gamma rays emitted by the explosions, which made it difficult to probe some of the supernovas' fundamental properties. However, SN 2014J is the nearest type Ia supernova to Earth detected in at least four decades, and scientists managed to analyze gamma rays from between 50 and 100 days after the explosion occurred, using the European Space Agency satellite INTEGRAL. Exploding white dwarfs should be full of nickel-56, an unstable isotope of the element. As nickel-56 decays, its byproducts give off specific wavelengths of gamma rays. INTEGRAL detected such radiation, with the levels hinting at an amount of nickel-56 equal to about 200,000 times the mass of the Earth. This is about what scientists expect would be involved with a type Ia supernova. These findings offer evidence that SN 2014J and other type Ia supernovas do probably originate from thermonuclear explosions on white dwarfs. However, astronomers have suggested another way type Ia supernovas can happen: when one white dwarf explosively collides with another. The researchers noted their findings cannot rule out the possibility of such a white-dwarf merger for SN 2014J. To confirm which mechanism actually caused SN 2014J, astronomers continue to gather data. "The search for clues on the progenitor is underway in radio, optical and X-ray bands," Churazov told Space.com. The scientists detailed their findings in the Aug. 28 issue of the journal Nature.